Huawei Ascend W2 user guide manual – Huawei Ascend W2 was released on December 2013 with budget price for Windows Phone lovers. 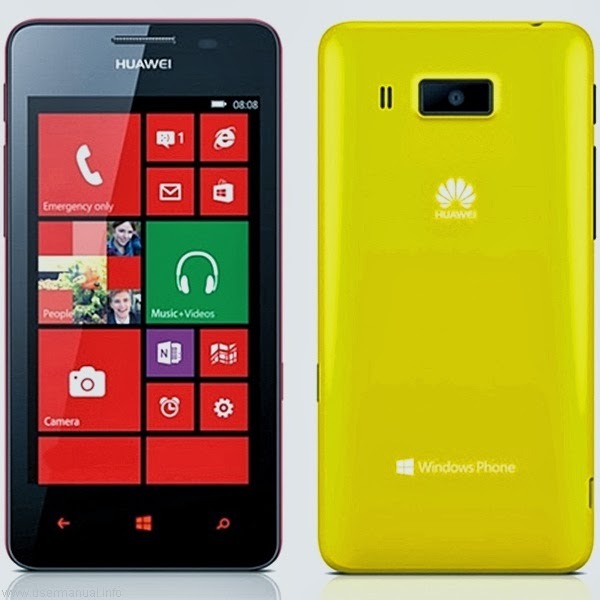 Huawei Ascend W2 is upgrade version from Huawei Ascend W1 with Microsoft Windows Phone 8 as the operating system. The Huawei Ascend W2 come with more big screen display size 4.3 inches comparing with the old series. Huawei Ascend W2 itself can hold with comfortable taste on your hand and have same weight like Nokia Lumia 928 for Verizon Wireless. Huawei Ascend W2 equipped with specifications and key features such as: 134 x 67 x 9.9 mm (5.28 x 2.64 x 0.39 inches) in dimension with 160 g (5.64 oz) for weight, 4.3 inches IPS LCD capacitive touchscreen display 16 million colors 480 x 800 pixels screen display with multitouch, microSD up to 32 GB, 8 GB internal storage, 512 MB of RAM, 5 megapixel rear facing camera but without front facing camera, run Microsoft Windows Phone 8 operating system, powered by 1.4 GHz Qualcomm MSM8230 Snapdragon 400 processor Adreno 305, Li-Ion 1700 mAH battery with up to 395 hours of stand by time and up to 9.30 hours of talk time. Huawei Ascend W2 user guide manualavailable to download pdf file format with 3.52 MB size and contains of 32 pages. The manual pdf of Huawei Ascend W2 come with installation and settings for better performance of your smartphone such as: lock and unlock screen, sign in to your phone, setting start screen and back of your stuff.